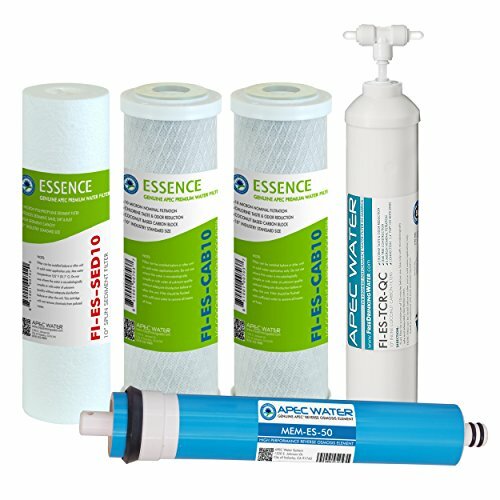 APEC Essence 5 stage complete filter set is made with high quality filtration components to protect and prolong the lifespan of your reverse osmosis system. Premium quality filter set lasts over 6 months for high performance contaminant removal, while the membrane and post carbon filter last 2-4 years. Compatible for APEC 50 GPD Essence and all other standard size under counter reverse osmosis systems. 1st Stage: Sediment removal 5 micron 10" filter -removes dust, particles, and rust. Protects and extends the life of the membrane and system. 2nd and 3rd Stage: Carbon block 10 micron 10" filter -gets rid of unpleasant chlorine, tastes, odors, cloudiness and colors. Also removes VOCs and other common chemicals from the water. 4th Stage: High Rejection TFC reverse osmosis membrane. Removes a wide variety of contaminants including arsenic, bacteria, chlorine, lead, fluoride, chromium, radium and more. 5th Stage: Coconut Shell Refining Carbon 10" filter -removes any possible residual taste from the tank. About APEC For over 17 years, APEC has been an industry leading manufacturer who specializes in high performance RO systems. As the original manufacturer, we have dedicated a knowledgeable and sincere team that is committed to providing customer satisfaction in hopes to bring many years of enjoyment and good health for you and your family.